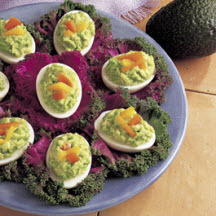 CooksRecipes has quality, kitchen-tested recipes for a variety of deviled and stuffed eggs that are perfect for parties and entertaining. For an easy, nutritious and always welcome appetizer, add these classic deviled eggs to your holiday dinner or party menu. 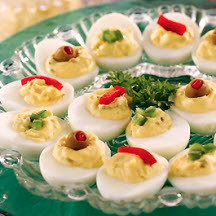 Festively garnished deviled eggs make easy, make-ahead appetizers for holiday parties. 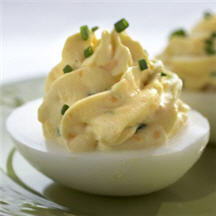 These pretty deviled eggs are heavenly bites of deliciousness!